This faceted glass chevron bead measuring only 8 millimeters in diameter was discovered at the Parkin site during a University of Arkansas Museum field school in 1966. Photo courtesy of Dan Seinfeld. 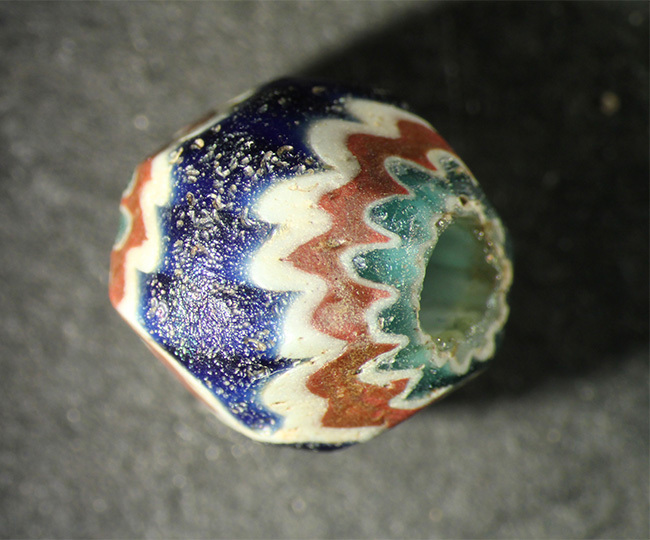 In 1966, a small bead made of several layers of glass was found at the Parkin site, a 17-acre fortified Mississippian village located along the St. Francis River in northeast Arkansas. Due to the site’s location, its configuration, and Spanish artifacts that have been recovered during archeological excavations, archeologists have proposed that Parkin is the site of Casqui described in the narratives of the Hernando de Soto expedition in the early 1540s. Casqui was thought to be a regional capitol, and the remaining mound on the site attests to the fact that a powerful chief probably lived there. We know from archeological work on other Soto contact sites that this type of bead (called a faceted chevron bead) was carried by the expedition for giving or trading to the Indians. Glass was unknown to the native inhabitants of north America and the material and colors of this small artifact would have made it a prized possession for anyone who got one. This multifaceted bead is of a very distinctive variety. Its seven layers of glass are the same color sequence as many beads from presumed Soto-related sites in Florida. Dan Seinfeld and Munir Humayun (Florida State University) have used mass spectrometry to analyze some of the glass layers and compared these with the corresponding layers in beads from the Florida sites, and found that they match in composition. Because batches of glass were not carefully measured when being concocted, the matching mixture must mean that the beads came from the same batches. There is no doubt that this bead came from the Soto expedition in 1541. It was probably made on the island of Murano in Venice, Italy, where almost all glass manufacturing occurred in the early to mid-16th Century. At a mere 8 millimeters in diameter, this tiny bead’s discovery was nothing short of a miracle. During a 1966 University of Arkansas Museum field school, Director Charles McGimsey had a road grader scrape off some of the plow zone in front of the platform mound at the site, and this artifact was found in the disturbed soil. The chances of it having been torn up with the grass and tossed aside or falling through the screen upon excavation are so much higher than this little artifact being found before it was lost forever! 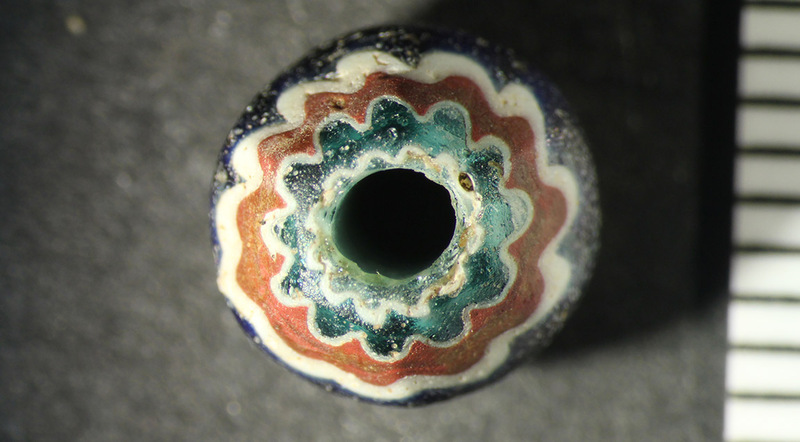 Despite the unfortunate circumstances of its discovery, this bead is of tremendous importance, because this variety is one of the most commonly found glass beads on early sixteenth-century Spanish sites in the New World. It is the only glass bead found in Arkansas that can be associated with the Soto expedition. This is undoubtedly due to the fact that the expedition had been traveling through the Southeast for two years without being resupplied, and they were probably down to their last few gift items. The bead is on display, along with the other Spanish artifacts found at the Parkin site, at the Parkin Archeological State Park Museum. The museum and park are free to visit on Tuesdays through Saturdays from 8am to 5pm, Sundays 1pm to 5pm, and some Monday holidays. Contact the park at parkin@arkansas.com or by calling 870-755-2500 for more information. End view of the Parkin chevron bead. This is the only glass bead found in Arkansas that can be associated with the 1541 expedition of Hernando de Soto. Photo courtesy of Dan Seinfeld.